Telangana DSC Notification 2017-18: Telangana State Public Service Commission (TSPSC) has announced 8792 district-wise teacher posts for aspirants wishing to become the school teacher, Apply TSPSC DSC Posts at tspsc.gov.in. The TSPSC DSC official notification 2017 -18 is going to be releasing shortly. As of now, the Government Order (GO) for Telangana DSC posts 2018. Candidates waiting for Telangana DSC notification can keep checking the TSPSC Official website, tspsc.gov.in. Candidates can keep visiting the official website on the regular basis because the notification is going to be announced shortly. Candidates willing to apply for TSPSC DSC jobs 2017 can check the details of eligibility criteria, Telangana DSC district-wise posts information, TSPSC DSC exam pattern, syllabus, TSPSC DSC application process, important dates and more valuable information from here below. 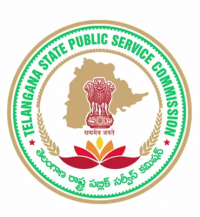 Telangana DSC Notification 2017 : Telangana State Public Service Commission (TSPSC) has announced the GO for 8792 DSC posts. Candidates keenly waiting for Telangana DSC Notification 2018 can check it from the TSPSC Official website, tspsc.gov.in shortly. Candidates applying for TS DSC Teacher Posts must have the suitable educational profile with Graduate Degree with B.Ed qualification. Candidates also must have the required percentage of marks in their Degree and B.ed. The complete DSC eligibility criteria will be given in DSC notification. 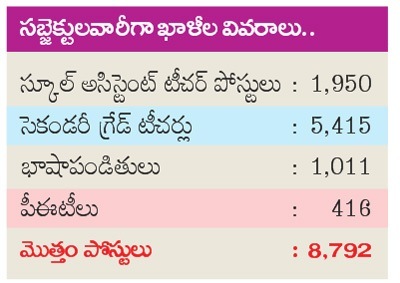 Aspirants applying for TS DSC teacher posts must fall in the age group of 18 to 35 years. Candidates belong to reservation category (BC/SC/ST/PWD) will have reservation facility as per the norms. Aspirants can apply for TS DSC notification jobs 2017 -18 by filling up the online application on TSPSC Official website, tspsc.gov.in. Candidates need to pay the required application fee to apply for the Telangana DSC Teacher posts. The application fee will also be as per the category of the applicants. Applicants have to pay this fee using any debit/credit cards. Selection of candidates for 8792 teacher posts will be strictly made on the basis of their performance of the test and interview. Candidates have to score good merit to get selected for the Telangana Government Teacher Posts 2017 -18. Selected aspirants will get good pay scale and grade pay by the Government. Aspirants can check the TSPSC DSC Teacher Posts information from here below. Here we have briefed the complete information for the understanding of applicants. Just do follow the info to check the overview of Telangana DSC Notification 2018. Applicants must possess the qualification of Graduate Degree in any discipline along with B.Ed or TTC from the recognized Board/University. Applicants must be in between 18 to 35 Years. Age Relaxation for reserved category people will be applicable as per Government norms. Selection Process will be based on the merit of aspirants in the written test. Candidates with best merit and rank will be given the top priority in the selection process. Candidates selected will be offered good pay scale + grade pay as per government norms. Interested and eligible aspirants can apply through online @ tspsc.gov.in. Download and observe the details clearly before applying. Attach the scanned copies of required documents, photo, signature. After filling up the application form check the details clearly once. That’s it! Your application has been sent successfully. The acknowledgment will be sent to the registered mail id. The Telangana State PSC is going to mention the application fee details in the notification. Candidates can check the details from Telangana DSC notification soon after it has been released. Candidates have to pay the application fee through online using any valid debit card/credit card/net banking systems. Aspirants can also download Telangana DSC Old papers, model papers, previous papers for reference purpose. By observing the previous papers candidates can get the idea about the type of questions asked in the exam, level of complexity of the question paper, time taking to finish off the complete paper and on various grounds. Hence aspirants can go through the old papers and practice exercises to get a clear understanding and to reduce the complexity in the examination. Talangana DSC Ki ap students eliagble or not please tell me.